Brighton is famous for the stunning colourful beach huts that line its shoreline and its role as one of Melbourne’s most exclusive suburbs. 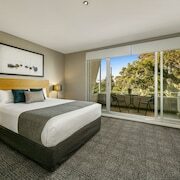 Popular among the elite of Melbourne, Brighton is a very relaxed and peaceful spot to holiday – far from the hustle and bustle of busier beaches. Browse our range of Brighton hotels and apartments so you can relax already. Even in its early days Brighton was considered a beautiful spot to live, attracting wealthy residents who wanted large pieces of land near the sea. The lands surrounding Brighton were farmed to provide Melbourne with fresh produce and reduce the number of imports from Tasmania. Surveyed in 1841, within five years Brighton was the third-most populated town in Port Phillip. Even this early on Victorians frequented Brighton for day-trips to the sea, which they still do to this day – though now it’s just a 20 minute drive. Lazing in the sun, swimming in the ocean waters and strolling up and down the shoreline are the obvious attractions in Brighton. Along Dendy Street Beach you will no doubt be captivated by the rainbow-inspired boxes that are private changing and storage facilities – anyone who’s been to Brighton has at least one photo! From here there are also spectacular views back towards the Melbourne CBD. There’s also a pedestrian and bike path winding along the Brighton coastline, lined with palm trees, gardens and lawns. It extends even further along Port Phillip Bay as part of the Bay Trail if you’re feeling energetic. Other sights away from the beach but by the same theme include the Middle Brighton Municipal Baths, home to one of the only remaining caged open water seabaths in Australia. There’s also the Middle Brighton Pier and Breakwater, and the Royal Brighton Yacht Club. Throughout Brighton, there are many beautiful gardens, as well as historic architecture just as worthy of your gaze – though the neighbouring multi-million dollar homes might just steal your attention. Amazing shopping and great dining creates a buzzing strip along Church Street, full of boutiques, jewellery shops, delis and restaurants to tempt you. In North Brighton, Bay Street is a more historic shopping strip combining more fashion and gift shops with cafes and restaurants. Martin Street is the place to go for gourmet food to pack for a picnic later! Most of the hotels, and a small commercial area, grace the foreshore along The Esplanade. With a low-key local vibe, trendy shopping and dining strips, and an iconic beach to pose on for your next Facebook profile photo, Brighton is a great spot to escape the hectic Melbourne CBD. This is where people come to indulge in the simple things. Channel your inner celebrity seeking a beachside rendezvous and book your Brighton accommodation with us. How Much is a Hotel Room in Brighton? 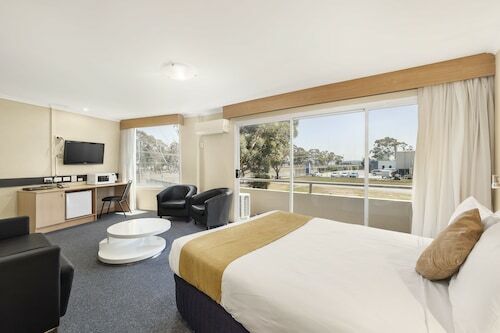 Hotels in Brighton start at AU$154 per night. Prices and availability subject to change. Additional terms may apply.